the wall is (supposed to, according to a couple french sources) a good exercise for building a quicker and more organized reaction. Not perfect though, since you instinctively know where the ball will go. BTW, are your eyes ok? Personally, since I became a little near-sighted because of my disgusting capitalistic and sedentary way to earn a living, I think my reaction time literally exploded. I may have to redraw this with info from The Art of Doubles information. 1/2 the problem is knowing if I should move forward or go back. And then knowing where I need to be to compliment my partner. However, since I was playing well a month ago and I seemed to have gotten a lot slower in my reaction time, I'm thinking of ways to improve my response. So improving my general health and alertness as well as consistent split stepping. Court geometry and coverage is/are certainly different for doubs. Now you will be covering a bit more than 50% of a court that is 1/3 larger than a singles court. I say more than 50% because there should be overlap for court coverage by you and your partner. I am assuming that a net player will, theoretically, be able to poach some of the balls that are crossing not too far from the middle of the net. Easier to poach when you or your partner have just hit a ball that is not too wide. For balls out to the alley (or are angled to pull the opposing player wide of the court), the net player will usually need to shift toward the alley somewhat to better protect against DTL shots (into the alley). A player in the back needs to be able to cover lobs over their partner's head. Also needs to be able to cover more angles on their half of the court since opponents can hit sharper angles into the alley. I've been trying to finish off my curtain mount for my gopro so I could take more recent videos of myself. I agree that does help a lot. I just bought one of these. I was actually looking for a double hook coat hanger to duct tape to my GoPro selfie stick. Like $4 solution. I just fold up the tripod ... slide two of the legs at the bottom through chain link fence (just a few inches), and use bungee cord at top. No wind screens ... so I can do this from inside or outside the fence. I have also cut a small pad the size of the phone, and bungeed phone to outside of fence with pad between fence and phone. I would have to come up with something else for indoor tarps and windscreens outside. I have a GoPro mount and an alligator clip for chain link fences. But I need something like @TagUrIt bought to hang on top of curtains. Ok, found the thread on cheap GoPro mount: Cheap Tennis Camera mount for the Fence!! To be clear, I'm not actually admiring my shot in the sense that I look at it and go, "damn, that's a great shot...probably a winner...no way its coming back"
I am fixated on watching my ball and where it lands and by the time my opponent is in position and ready to hit the ball, I find myself out of position, no split step and late in reacting to the ball coming back. My son even comments on quit admiring your shot and get back into position as soon as you strike the ball. You need to improve your core strength and core stamina which in turn improves your recovery and balance after each shot. Started doing some light work-outs off the court again. I'm a pretty good mountain biker. So core and stamina is not bad but of course could always use improving. I attended a Skills/Drills class last night. My main focus was on split stepping and racquet position. I think I did well at net and moving around the court. I was still slow to recover after ground strokes. My legs were toast after about 70min... I had a hard time catching my breath during the reflex volley drills. But maybe it was because I stayed in the play the longest out of the participants. Most of them were "green" players. Maybe 1 "blue" player. Mountain biking fitness or even running fitness isn’t the same as tennis fitness. I used to cycle and mountain bike. I used to run a lot. I’ve run a marathon before. That fitness did not translate into core rotation strength, speed and stamina. Running and cycling has little to no lateral movement and agility involved. Nor is there any core rotation involved. Cardio fitness doesn’t equal tennis fitness. The sooner you understand this, the better for your improvement of your game. Good luck. $90 is way too much money. You can go to Best Buy and get a $25 Gorillapod that mounts a camera or phone to almost any fence, tree, pole, etc. I have an external battery pack and I can shoot as much 4K video as I need with no need for any additional equipment. If you want the camera higher it's not that much considering the convenience and design. You can design and build something similar for about $50-60. So this is $40 more for someone else to do the work and a more stable robust design. Dissociate your lower body from your brain. Learn to recover as you're admiring the shot. Then, learn to admire the shot with your peripherals while keeping track of your opponent's response to your shot while you are recovering. Always move for the next ball, even if you don't believe it's coming (lie to yourself and say that it is). This is a wonderful thread title. pretend you're nadal and be humble no? 1st match of 40+ in the books. I played line 2 doubles. Won 6-2, 6-3. Probably one or two points where I could have moved to a better position, but otherwise played solid. Gave up 2 shots long, 2 into the net and 2 DFs. Otherwise, no other UE. My partner made unbelievable volleys but missed gimme volleys and OH. But it was enough for the W.
I can't complain about my play. The one out of position play was my partner was in a net battle and I left the court open for a super sharp angle with nothing on it along the net while I was back at baseline. Another match tomorrow. We'll see if tonight's performance was a fluke. Actually, my eyesight (especially as it gets dark or when there is contrast in lighting) has gotten worse. There are some clubs with direct lighting that I have a very hard time playing. 2nd match happened on Sunday. Opponent's weren't very strong. Or rather I should say that we were able to deal with whatever they dished out. But toward the end of the 2nd set, I had a hard time tracking the ball on ROS. I think I blew all my ROS. I had my partner receive game point. Still, we won 6-2, 6-0. The only two losses coming from getting our our initial service games broken with a couple DFs each. It seems if I'm tired, or in this case, feeling a bit under the weather, that fatigue sets in early. So I'm finally catching myself with frozen feet watching my shot to see if it goes in or out. So I've been focusing on moving back to ready position as I watch the ball when we do court warm-ups. I think that's a start. Hopefully I can make this more automatic. But just being conscientious of it has helped be in position better, occasionally I'll split step correctly and this has helped immensely to return the ball very smartly...especially at my level. Could also be related to where you are positioning yourself after a shot, more than lack of effort. There is a reason why some people can run fast but seem out of position, whereas some others don't have the quickest feet but always seem to have plenty of time to play a shot. Not admiring my shot, rather looking up too early to see if I pulled it of. Too bad this happens specially often when going for a winner, or on "difficult" shots, where focusing on the ball would be extra welcome..
What happened to "keeping eyes at contact point through the contact"? Oh, that is just an ambition for a weekend/twice a week hack like me. Working on it! To me (another hack, but practically daily) is the magic pill, or the only thing/the least I can do towards the end of my practices to get things back on track. Especially when they say to think about only one, max two technical things during your shots? 1) bounce ... if I take a visual snapshot in my head when the ball hits the court, it helps me with prep (not late). Snapshot at bounce, then more casual tracking to hit below. 2) hit ... I take a second visual snapshot from the top before the drop to slot. This is different than the bounce snapshot, more like hd video from top to contact. I couldn’t figure out how this worked at first, seemed I needed to go intense focus later ... like from slot. It all happens to fast ... at least for me. From top of backswing to contact is go time. I could not be a player that kept an intense focus the entire point. I do fine without ever adding the extra 2 extra intense focus points, but I do noticeably hit cleaner when I do. 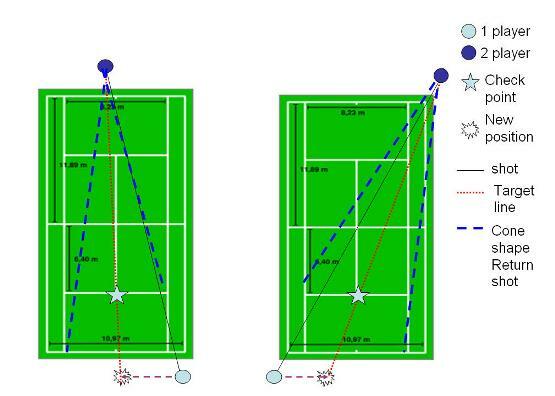 My problem is I do it with ball machine, but then forget with actual play. I am convinced, I would hit cleaner, including ros if I did this every swing. I don’t stare at contact point after ... actually not I actually ever stare at contact. It’s more staring before contact to the hit ... but don’t see the hit. Anyway ... seems to work for me. It’s all just a trick to really focus at the right times. To make your bounce/hit work for you during play, you may want to make it the only technical thing you think about during shot execution. I personally dunno about your bounce/hit.. I might try it, but to be honest I have an enough hard time to remember to inhale when the opponent hits and start exhaling on the bounce (plus the split step before and eyes at the contact thing). It's been posted here that not even pros do actually see the hit, but at contact point. Also one is not supposed to see if the ball hits the net, but "hear" it instead. Well dunno about your bounce/hit.. I might try it, but to be honest I have an enough hard time to remember to inhale when the opponent hits and start exhaling on the bounce (plus the split step before and eyes at the contact thing). I have never once thought about breathing, and I first see the ball somewhere between service line and net. It’s actually not as easy to figure out when you first pick up the ball (blur). But for sure, I pick it up before the net. I have checked myself on video to see if I look up or pull up before contact, and I do not. Funny story on breathing. I had a good friend... USTA teammate that picked up the habit of holding his breath for the entire point. No idea why ... played high school sports so was used to pressure. When I found out ... told him all our singles points were going to be long points. As for not picking up the ball early, that might not be bad, as a former head coach at my previous club told me to watch the opponents racquet first, b/c "the ball will reappear". So I'm finally catching myself with frozen feet watching my shot to see if it goes in or out. Doesn't matter if you see it in or out. It is in unless your opponent sees it (or calls it, anyway) out. So, treat it as if it's definitely going in and it is definitely going to be hit back. Yes, I have to realize that after I've hit the ball, there is nothing more that I can do except get back into position for the return. I'm slowly starting to move my feet as I watch the ball. It seems to start with being aware of it during warm ups or practice rallies. Then hopefully some of that carries over to matches...slowly.